An inspiring photo book by photographer Lauren Fleishman that will share the stories of couples married over five decades. Now available from Schilt Publishing. 522 backers pledged $25,847 to help bring this project to life. Love Ever After will share the love stories of couples who have been married for at least 50 years. 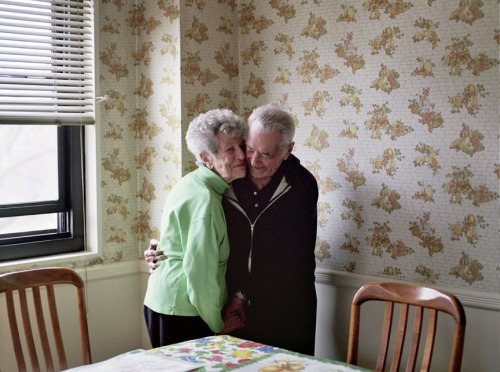 Inspired by a letter my grandfather wrote to my grandmother during World War II (and rediscovered after he passed away in 2007), I began photographing and interviewing couples in the New York area as a way to preserve their stories and to illuminate our universal experience of love. "April 14th will be our 68th wedding anniversary. That's right, you heard it! Friends ask me how I managed to get someone like Jean. So I have one expression. I prayed well." Abe Small, March 2, 2011. This has been much more than a photography assignment for me, and Love Ever After will be much more than a photography book. Please help me to give a voice to these couples and preserve their love stories for generations to come. "We met when we lived in China. I was on vacation in another town and we only saw each other for three days. We lived very far apart and so, when I returned home, we sent letters. At that time we didn't even have a telephone! We wrote letters each week but it took about 20 days for our letters to reach each other. We did this for five years." Jin Lin Chen, March 15, 2011. "You have to remember the times were different. We met in the 1939 and we didn't have money. So our group of friends always met at our friend Betty's basement. There weren't things like dates and going out to dinner. We didn't know from those things because we didn't have money. So we enjoyed each others' company. " Fran Futterman, April 25, 2011. "Everyday my wife expresses her love for me. She says, did I tell you how much I love you today? Everyday. Everyday she says that." Moe Rubenstein, August 24, 2008. Thank you for your time, and for helping to spread the word about this project. and will receive a handwritten postcard print featuring one of the couples from this project. You will receive all of the above, plus a limited edition 5x7 signed print from the project. You will receive a 12-month calendar with photographs from this project. Love will smile upon you all year! You will receive a copy of the book documenting this project, and the satisfaction of knowing that our shared dreams can and do come true. You will receive a signed copy of the book from the project and, when you open it, you will find your name inside. You will be written into the book of love. You will receive a signed and inscribed copy of the book, with your name inside, and a limited edition signed print suitable for framing. You will receive a signed and inscribed copy of the book, with your name inside, and an invitation to visit me in Brooklyn (with a loved one) for a portrait session.